As the speculation mounts about Jermaine Beckford, alongside the price, I think it’s worth taking a look at other players that Newcastle United should really consider making inquiries for. All the media hype has been about Matthew Kilgallon & Jermaine Beckford and I’m sure about 96% of my articles this new year are revolved around the Sheffield United centre half and the Leeds United hitman. I’m sure there’s many players out there vying for a move to Newcastle and below I’ve put together three players which I think would be worth a shot at St.James’ Park. I think it’s fair to say that Peter Whittingham, although not a striker, is on red-hot form this season. Cardiff have had a mixed season so far but still linger in a healthy position. 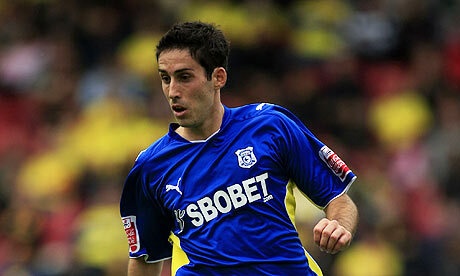 A lot of it comes down to Michael Chopra and this guy, Peter Whittingham. He’s already racked up 15 goals in all competitions with 13 of them coming in the Coca Cola Championship. Not half bad if you ask me. We don’t know what Cardiff would ask money-wise for him, if they would be forced into selling him that is. I think £4 - 5m would prise the 25 year old from The Bluebirds. Billy Sharp is only 23 years of age but has already played for a whole host of clubs. From Sheffield to Scunthorpe and back to Sheffield again, this season, we can see why the Blades forked out £2m for him, only 2 years after letting him go for about £100,000. Sharp’s netted 10 goals already this campaign for Doncaster and proven to the fans why Sheffield Utd did indeed pay millions for him. In a good run of form with Doncaster, I’m sure neither the Blades or Sharp could turn down a move to Newcastle United, the league leaders. Although a life long Sheffield fan, I’d fancy our chances of signing the 5’6 striker. Nicky Maynard needn’t score a more spectacular goal than his effort against QPR a few weeks ago to secure interest from teams across the country. A wonderful goal to say the least and not a one hit wonder either. Maynard has bagged the same amount as Kevin Nolan (10) and to be honest, I think he’d be worth having a look at. He’s only 23 and seems to have a lot left in him. I rate him in the same bracket as Jermaine Beckford and he’s certainly one of the best strikers in the Coca Cola Championship at the minute, in a Bristol City side that’s picking up form all the time. So there’s my three players that I think are worth a shot, and as good as Beckford to say the least. They’ve all scored double figures this season and I’d be confident they’d seriously consider an offer from Newcastle United. So Chris, if you’re reading, do take notice because these are three talented lads and might not cost £3m either. Id swap Maynard for Beckford in a flash. The lad is far better than Jermaine but I dont see you getting him for 3m..
Why pay £4m-5m for a player when NUFC can wait till the summer and get Beckford for nowt. Its Leeds fault they didnt tie the player down earlier on so i cant see how they expect £3m for a player where they will get nowt for in the summer. Maynard could be the new Cole, from the same club. If you pay peanuts you will only sign monkeys. Open your chequebook Ashley. i thought Nathnan Dyer was one of the best players at St James this season ! Hi - doesn't Billy Sharp play for Doncaster Rovers on loan? He did nowt at the Blades, so seems to blow hot and cold a bit. He'd be a big gamble. Beckford looks premier league class to me, he certainly has the pace. If Beckford costs £3m, and then we manage to ship Geremi out, then that seems like good business. Beckfords Nuts....as much as i dont like Ashley im impressed hes opening his cheque book for even beckford and killgallon. We should save the big bucks for next season when we (hopefully) in prem and need it! Doocey...nice article, good to see someone doing an article not replicating a news report. Whittingham is a skillful player and certainly has new potential and Cardiff are apparently in financial trouble. Billy Sharp certainly can score goals but Sheff Utd must have saw something he hasnt got for them to pay so much and hardly play him. As fas as Maynard goes, havent seem him play but what a goal he scored and wouldnt mind some of that at St James. I am abit sceptical about Beckford as the press and Leeds fans say he needs three strikers id prefer Billy Sharp probably. **I am abit sceptical about Beckford as the press and Leeds fans say he needs three chances to score one. Out of the four strikers id prefer Billy Sharp probably. Would rather sign Moses a guaranteed future star from Palace, but would have to probably pay more than 5m. @ 19 he`s already worth it. If we dont get Simpson, should go for Coleman @ Everton, possibly less money and the makings of a better player.My two cents. Yeah Billy Sharp is on-loan with Doncaster and doing very well with them. He's a neat player but I must say out of all three Nicky Maynard appeals most to me. Young, energetic and a goal scorer, at Championship level at least. We are looking to sign Chopra. Why hasnt Beckford not signed already, maybe its because even though Leeds will be playing Championship football next season they wont pay him anywhere what he will get if he signs for NUFC, and after all thats all that players are interested in Money. Beckford has not signed because he wants more money. But he is a Leeds player until the end of the season and we don't need to sell him to raise the cash. Therefore as we don't need to sell him and we don't want to sell him the price has got to be right. Furthermore as 20% of whatever we get for him will go straight to Wheldstone, why would Leeds sell him to the Toon fo 1.25m and only pocket £1m for a player who is scoring our way back to the championship where the rewards for the club will be far in excess of £1m. If you don't what to pay its simple wait till the summer and get him for nowt. Arlreet Dooce, speculation from within? Liking it!! Can't help but think Whittingham would be snaffled from under our noses by bigger and better prospects at the minute. Maybe next season if we go up and show some promise. Aye Billy Sharp knows where the goal is down at these levels but could he cut it any higher? Got me doubts. That Maynard goal was a bit special eh? Kept watching it over and over again... Another one who might be a gamble at a higher level, but might do a job getting us there at least. bowburnmag : Nice to see you around mate. I do like Maynard, and not just from his wonder strike. He's a predator in the box and I think he'd be a very good buy. Needless to say Maynard isn't on Hughton's wishlist. It really irritates me when people who don't watch Beckford on a regular basis state how they think he is "Premier League class". He takes 4-5 chances to score in league one, which doesn't bode well for him in the championship and definitely not the Premier League. Big mistake!!! we will go up in this season and because of that beckford wont go. he will sign a new contract with us. if nufc go back up to the prem this season which looks likely i cant see them wanting to sign a player thats only played in league 1. Maynard looks a canny player. If we're going to spend £2-3M on a striker in this financial climate, why not go for Chris Boyd. An international CF at the peak of his powers. Im certain he would rather come here to the top club than Smogland despite Strachen. Maybe one to try and hijack. How come nobody seems to mention Joe Ledley????? For me; he is twice the player Whittingham is and any cardiff fan will tell you he is the player that makes them tick; it is just whittingham's goals this season whcih are grabbing the headlines. What some of you may not know is that Ledley is out of contract at the end of the season; just like Beckford. If we could snap him up for 3-4 million pounds then we would have a real player on our hands! I thought Maynard was extremely poor at st. james this season when up against decent defenders; he didnt get a sniff! I'd go for Ledley, Beckford, Kilgallon and Moses. Buying those four players will save us millions in the future and i believe all four will go on and prosper in the PL in years to come. Really enjoying the blog doocey; good stuff man! Why are people talking about Chops for, we already know he can't score goals in th PL, he's been there before &amp; failed, why else would he still be in th fizzy!!! £3m for a league 1 player is stupid, yes he can score goals but thats in League 1, not the fizzy or PL, in fact none of the players you've mentioned have any experience playing in the PL, so maybe ok for us to get up but what then, we have to sell them on again, Becks is 28, the others early 20's, you do the maths!!! I think we should be after PL players who are willing to drop down to us knowing we're going back up, Simpson is a prime example of a player who's willing to give up the chance of playing for Manc Usa, just so he can help us gain promotion, so is Harewood, tho I would expect him to cut his wages a bit, you'd be surprised at who'd come to us from the PL!!!! I live in Leeds and occasionally watch them as a neutral - Beckford is a big fish in a small pool, and it's absolutely right that he needs 4-5 chances to score just 1. He WILL struggle at a higher level where he'll have less time and space. Remember Leeds are pummelling other teams in that division and he's getting chances galore. Also has a big time charlie attitude. In my opinion we should steer clear but it looks as though Houghton is is adamant he wants him. If we signed any player from Leeds it should be Snodgrass, everything goes through him and he's got the midfield creativity we lack. Northern_Jedi : Thanks, and I did consider mentioning Ledley here, it's just that I think the likes of Everton &amp; Aston Villa are after him so I doubt he'd make the move to us, although that's not for sure! Northern_Jedi : Thanks, and I did consider mentioning Ledley here, it's just that I think the likes of Everton & Aston Villa are after him so I doubt he'd make the move to us, although that's not for sure! I think Ledley and Boyd are the players we need to go for, theyl add depth to our middfield and strike force. Ledley can provide from the left which we have lacked since the Ginola/Robert days, bringing in Ledley will be more of a benefit to Ameobi and Carrol. As for Boyd DJG is completley right in what he is saying has got CL expierience good international goal scorer and an excellent striker in the SPL, i think hed much welcome a move to NUFC over the smoggies as i cant see them getting promoted if they lose Johnson. Defender wise extend Simpsons loan and sign him in the summer as hes a free agent, and look for another loan siging at center half, because Kadar has shown promising signs that he could be a big prospect for the future. blackett,leeds will be in ccc next season and are bigger than newcastle,world wide fan base of leeds probably twice as big as newcastle so don't think they can come and cherry pick snoddy who is on a 4yr deal,he wouldn't be interested and leeds utd wouldn't,reason beckford who is out of contract in 4 months didn't ask for transfer when your bad manager made a few bids,I think your boss thought he would so offer so little.I say you have a bad manager as any manager should have prem players near top of ccc and you will see how bad he is when you lose them players. Leeds bigger than Newcastle? Your having a fair dinkum laugh! Here in Australia our Newcastle supporter base is massive. Chelsea, Man United, Liverpool and Arsenal dwarf us but we still have some clout. Leeds had some fan spike when Viduka and Kewell played for them but like good bandwagoners most are have dropped off them when relegation hit. Not Newcastle, in fact Newcastle fans have seemed to increase since relegation here in Australia. Anyway, the point is Newcastle are a much bigger club than Leeds, anywhere around the world. As for our transfers..... I like Beckford but not for £3m, no way known. Why not put in a tad more for Victor Moses at Crystal Palace? He will be a massive player in the future. Also why hasn't the name of Miles Addison from Derby been mentioned? Young and really has all the potential in the world. Will be a much better player than Kilgallon. Both players have massive potential to develop into good Premier League quality. With Tamas Kadar developing nicely I have more confidence in him being a backup for us and with Barton back soon playing Nolan in a more advanced role, we don't need to overpay for players in January. I would like signings no doubt for depth and insurance to get out of this damn division, but lets not overspend now and regret it in June. Also we need to keep investing in young talent for our academy. The one thing Ashley did well at the beginning is get in some good young talent. Nile Ranger coming through is evidence that system works. Getting Aaron Spear was a massive coup that was seriously underrated. Arsenal were into this kid big time but Dennis Wise convinced his family Newcastle was best for him. Hopefully we will see the benefit of this move in the near future. Spear is a real hotshot and I noticed is doing well in our reserves. beckfords only going for financial reasons. if it was about football he would stay. i say lets take the 3 million get a good replacement and move on. you will soon see who comes off the best in this and i doubt..it will be you somehow. Don't you know that it is high time to get the home loans, which would make your dreams come true.